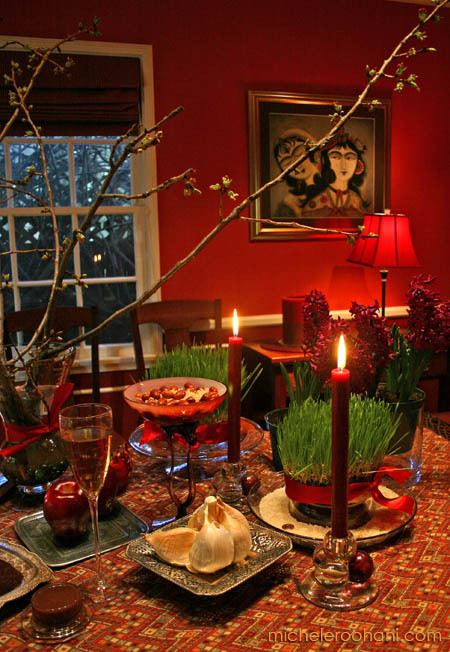 This entry was posted in culture, images, nature, photography, poetry, quotes and tagged haft seen, haft sheen, hourieh tahmassi, norooz, norouz, persian new year, poetry, rumi, sohrab sepehri by Michele. Bookmark the permalink. for sure no.. Very interesting and all my best wishes for your new year. I’d like to taste all that meals and candies. the choice of Sepehri is great. What a great poet. la nuit est unifiée, fluide, épandue. Bonne année à vous Michèle et à ceux qui vous sont chers. Very tastefully done and informative. Happy No Ruz to you too! سلام شما هم زیاد بهاری هستید. سبز باشید. Aideh shomah mobarack Dordaneh joon. 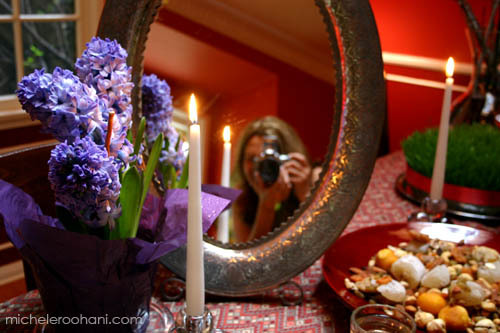 I’m sad to not be home for aide this year, but I’m going to travel 1.5hours to the only decent persian restaurant in the bay area this weekend to celebrate. Ce que je vois me donne envie d’être persan…Ta maison est belle. nice short trip to Iran. 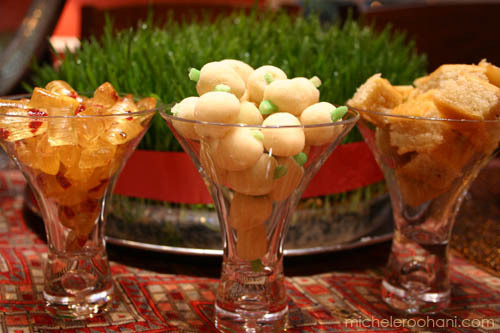 a nice taste of noruz! why do we have to give up those refined traditions for the black head-covers which only profit their textile industries and false religions? Eid shoma ham mobarak – These pictures are so beautiful – Good job as always, very informative too. Many thanks for your beautiful photos and good information about 7 sin. Wish you a happy happy new year. Quelle belle évocation et quelle histoire !!! Un merveilleux voyage aux racines de votre brillante civilisation. salam, man kamelan etefaghi be site shoma link shodam va az in etefagh kheily khoshhalam alan chandin daghighe ast mahve aks haton hastam, vaghan aali an, por roh va ziba. It seems as if the hypocrisy/stupidity of the current whitehouse residents will never cease to surprise me. They are talking up the “need” to attack Iran and in the meantime having fun celebrating nowrouz! Just had to let you know that I really enjoy the depth of your thinking and what you share in your website. kheyli etefaghi baad az search dar morede noruz baraye yeki az dustane kharejim be inja residam . sadeghane begam ,man ke asheghe Irano farhange kohanesham dashtam kam kam noruzo faramush mikardam ,vali in axaye ghashang mano be fekr foru bord . (man chand sali hast Iran nistam). HI thank you for your really nice and beauty image and pictures . i really enjoy it! sale no mobarak.the pics r very beautiful. Ah, so festive, happy New Year! Hi tanks. Happy new year. ejaze daram baraye chand hafte az yeki az axaye shoma estefade konam?? I heard that it was sharab before, but I think its not right, because Sharab is an arabic word too,such as mashroob, shorb, I’m not sure ,but we have to ask this from someone who know parsi language very well. You’re right that Sharab is NOT a persian word and could not have possibly been a staple of the Persian new Year table prior to the Arab invasion. Those who claim Haft sheen, unfortunately have twisted the truth to fit it in with their political agenda. Haft sheen is a lie and haft seen is our national tradition regardless of religion. 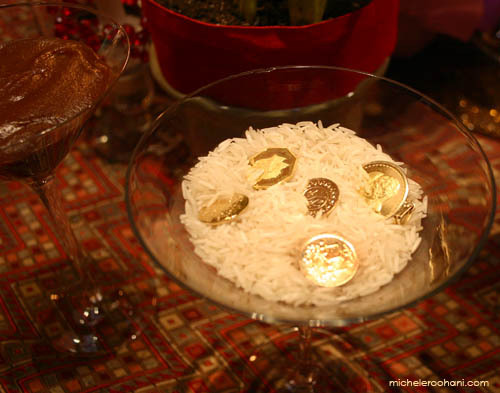 A very Happy New Year to all Iranians. The made-up myth about haft sheen has been debunked by Persian Scholars. Even Avestan Zoroartrians agree that sharaab is an Arabic word that would not have been used in a pre-Islamic Iran. It’s impossible. Also, even if we all agree that Arabic and Persian were interchangable in ancient Persia (which they were NOT), but even if~~why would they change the entire list just to remove one “objectionable” item? There will always be people who want to politicize this secular, and non-political celebration, but we must not give these attempts feet. 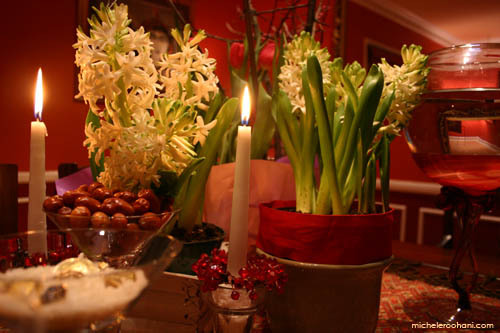 No poltics and no religion in Norouz. Let’s keep it that way. 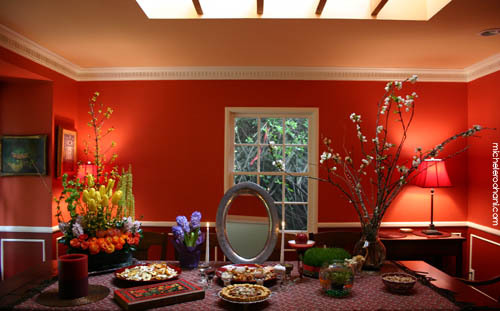 I’m sticking with my beautiful haft-seen, just as all my ancestors have… Ancestors who respected our beautiful celebration of the Spring Equinox without tainting it with political agendas and religious vendettas. salam dordaneh aziz va honarmand az didane axhatoon besyar lezat bordam. ejazeh daram baraye tabrik sale no 1391 az axe noroozetoon estefade konam? pishapish sali sarshar az eshgh aramesh va salamati barayetan arezoo daram . Just FYI, as much as I’d love to rail on the cancerous Islamic Republic regime, the pre-Arab “haft sheen” is purely a myth made-up to further political agendas, as if the Iranian people need to be lied to in order to see the atrocities of the current “leadership”. According to a unanimous consensus among Persian scholars, before the Arab invasion Persians would have NEVER used the words sharaab or sharbat, both of which are purely Arabic words (they derive from shorb (which means drink). 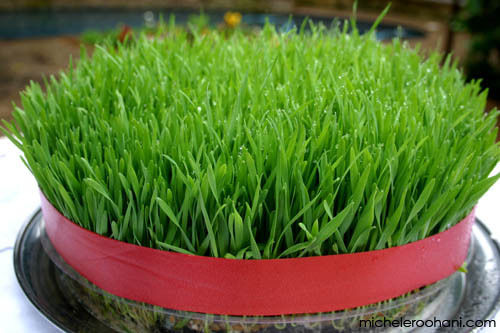 Soooo, please go back to your haft seens which is precisely how Iranians have celebrated Norouz for thousands of years devoid of political agendas and unfortunate and unnecessary lies. It’s haft seen and it’s been haft seen since the times of Zoroaster. 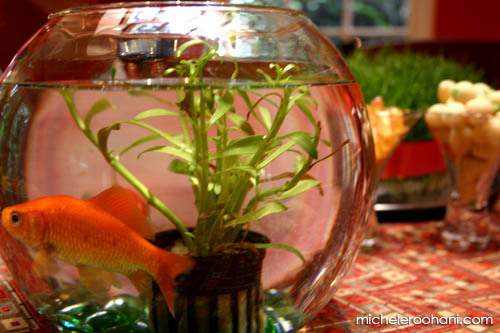 The only things that people have added to the sofreh-yeh Norouz that wasn’t there originally is the Quoran and the goldfish, both of which were added later. Haleh, thanks for setting the record straight. The sharaab also seemed a bit fishy to me! عید همگی مبارک سال خوبی داشته باشید.